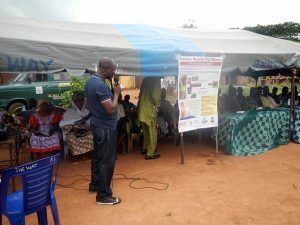 On 2 September, IITA organized a field day for farmers and extension workers in Idologun, Ogun State, as part of efforts to control the recent invasion of the Banana Bunchy Top Disease (BBTD) in Nigeria. The field day aimed to demonstrate and deploy control measures for the eradication of infected plants and recovery of production in BBTD-infested areas. Idologun is one of the BBTD-affected areas. 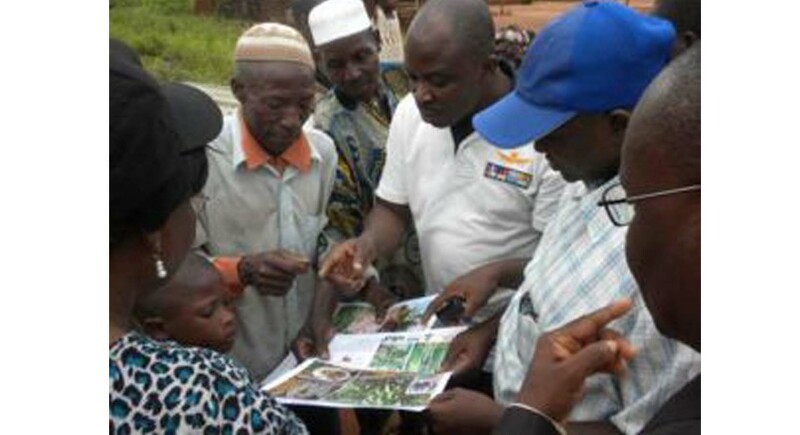 It is part of the pilot sites benefiting from the control measures implemented through a project on BBTD control in Africa funded by the CGIAR Research Program on Roots, Tubers and Bananas (CRP-RTB) and implemented by IITA, the Nigerian Agricultural Quarantine Services (NAQS), and the National Horticultural Research Institute (NIHORT), Nigeria. Lava Kumar, IITA Virologist, led the team of experts from IITA, NAQS, and NIHORT to Idologun for the field day, with over 150 farmers and extension workers in attendance. The field day also served as an avenue to create awareness about the disease, and educate farmers on how to produce clean planting materials as well as learn about business opportunities for rural youth in production and supply of banana planting material through a model being developed in collaboration with IITA Youth Agripreneurs. BBTD is the most destructive virus disease of banana caused by the Banana Bunchy Top Virus (BBTV). The disease spread in West Africa (Nigeria and Benin) was discovered in 2011. 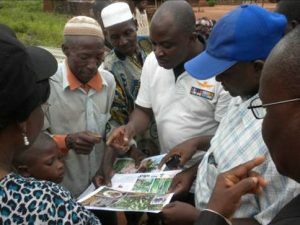 Since then, IITA scientists Lava Kumar and Rachid Hanna (IITA entomologist based in Cameroon), along with national partners have been spearheading control efforts. The disease spreads through infected planting material and through an insect vector known as the banana aphid. “Without intensive control efforts, the disease will continue to expand in West Africa,” said Charles Onyeani and Ogunfunmilayo of NAQS. “The supply of clean planting material is key to improving banana production in affected areas,” says Dr Sunday Akinyemi of NIHORT. Congo Brazzaville, DRC, Gabon, Nigeria and Malawi. Copyright © 2017 IITA & Disclaimer & Copyright.